Cardil (Diltiazem) is a calcium-channel blocker with peripheral and coronary vasodilator properties. It lowers blood pressure and has some effect on cardiac conduction. Cardil interferes with the influx of calcium ions through the channels of active cell membranes. 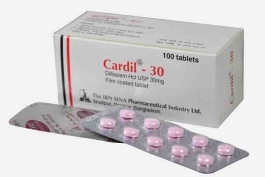 Cardil is used for the prophylaxis and treatment of chronic stable (classical) and vasopastic angina pectoris and has also been used alone or in combination in the management of hypertension, also, Cardil is effective in myocardial infarction, coronary artery spasm, arrhythmias, Raynaud's phenomenon, oesophageal motility disorder and migraine. It is available as 30 mg Tablet. 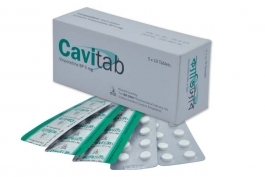 Cavitab improves cerebral metabolism. It increases the glucose and oxygen consumption and utilization of the brain tissue, improves the hypoxia tolerance of the brain cell, shifts glucose metabolism towards the energetically more favorable aerobic pathway, exerts antioxidant activity, as a result of all the effects it is a cerebroprotective compound. Cavitab considerably improves cerebral micro-circulation. It is available as 50 tablets in blister pack. 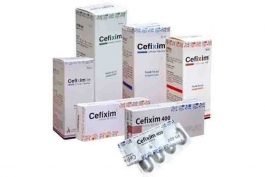 Cefixim (Cefixime Trihydrate) is a third generation Cephalosporin antibiotic indicated for RTIs, GITIs, UTIs. Available as Capsule and suspension. It is a semisynthetic antibiotic derived from lincomycin. It is indicated in the treatment of the following infections caused by susceptible anaerobic bacteria or susceptible strains of gram positive bacteria such as Streptococci, Staphylococci and Pneumococci; Upper respiratory infections, Lower respiratory infections, Skin and soft tissue infections, Bone and joint infections, Pelvic infections, Intra-abdominal infections, Septicemia and endocarditis, Dental infections. As an alternative therapy when used in combination with quinine or amodiaquine for the treatment of multi-drug resistant Plasmodium falciporum infection. It is available as 150mg Capsule and 300mg Capsule. 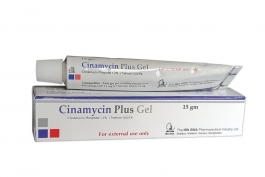 Cinamycin Plus Gel is a combination of lincosamide antibiotic Clindamycin phosphate and retinoid Tretinoin. It is indicated for the the topical treatment of Acne vulgaris in patients 12 years or older . It is available as 15gm gel in a tube. 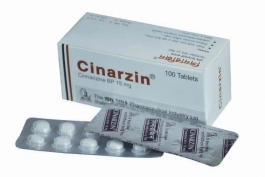 Cinarzin (Cinnarizine) is a piperazine derivative with histamine H1 receptor and calcium-channel blocking activities. Cinarzin diminishes the main action of histamine in the body by competitive, reversible blockade of histamine receptor sites on tissue. It is indicated for the following reasons: Cerebral circulatory disorders: • Prophylaxis and maintenance therapy for symptoms of cerebral vascular spasm such as: dizziness, tinnitus, sleep rhythm disorder, depression, loss of memory etc. • Sequelae of cerebral and cranial trauma. • Postapoplectic disorders. • Migraine. Peripheral circulatory disorders: • Prophylaxis and maintenance therapy for symptoms of vascular spasm and arteriosclerosis such as: acrocyanosis, intermittent claudication, cold extremities, paresthesia, varicose ulcer, Raynaud's syndrome etc. Disorder of balance: • Prophylaxis and maintenance therapy for symptoms of labyrinthine, vestibular irritability, Meniere's syndrome such as: vertigo, dizziness, tinnitus, nystagmus, nausea, vomiting. • Prophylaxis of motion sickness. It is available as 15mg Tablet. Cinarzin Plus contains two active ingredients Cinnarizine and Dimenhydrinate. The two substances belong to different groups of medicines. Cinnarizine is part of a group called calcium antagonists. Dimenhydrinate belongs to a group called antihistamines. Both substances work by reducing symptoms of vertigo (a feeling of dizziness or spinning) and nausea (feeling sick). The combination product is more effective than the individual compounds. 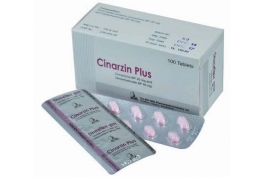 Cinarzin Plus is used for the treatment of various kinds of nausea and vertigo. It is available as 10 x 10’s tablets in Alu-PVC blister strip. 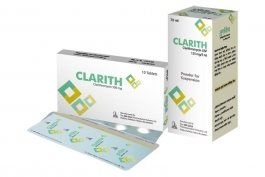 Clarith is a preparation of Clarithromycin. It is a macrolide antibiotic, indicated for LRTIs, URTIs & Skin and soft tissue infection. It is available as 500 mg Tablet and 70 ml (125 mg / 5 ml) Powder for Suspension. 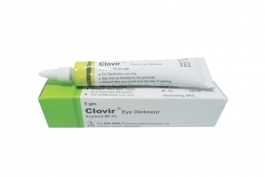 Cloram (Chloramphenicol) Eye/Ear Drops & Eye ointment is an Ophthalmic and otic anti-infective sterile preparation of Chloramphenicol. Used in a variety of infections caused by sensitive organisms such as: conjunctivitis, blepharitis, corneal ulcer, dacryocystitis etc. Ear drops is indicated in external ear canal infection. 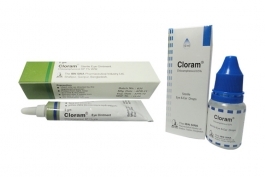 Cloram is available as 10 ml sterile eye & ear drops and 5 gm sterile eye ointment. Cloram-D is a combination preparation of Chloramphenical (a true broad spectrum antibiotic active against a wide range of gram-positive and gram-negative bacteria, many anaerobic bacteria, chlamydia and rickettsia) and Dexamethasone one of the most potent corticosteroids; it is 5-14 times more potent than Prednisolone and 25 - 75 times more potent than Cortisone and Hydrocortisone. 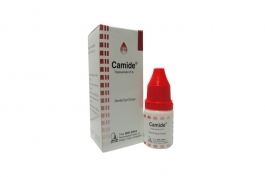 Used in acute and chronic keratitis and conjunctivitis of an infectious, allergic but non-viral nature. Infections of the anterior uvea (iritis, iridocyclitis), scleritis, episclcritis, myositis and sympathetic ophthalmia. Post operative management of glaucoma, cataract and strabismus. 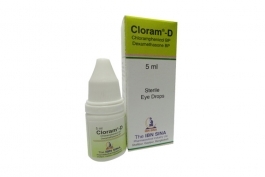 Cloram-D is available as 5 ml sterile eye drops. 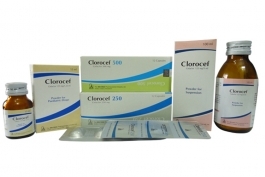 Clorocef (Cefaclor) is a second generation broad spectrum semisynthetic cephalosporin antibiotic. It is indicated for the treatment of the following infections due to susceptible microorganisms: Respiratory tract infections including pneumonia, bronchitis, exacerbation of chronic bronchitis, pharyngitis, tonsillitis and as part of the management of sinusitis; Otitis media; Skin and soft tissue infections; Urinary tract infections including pyelonephritis and cystitis; It is effective in both acute and chronic urinary tract infections. It is available as 250mg Capsule, 500mg Capsule, 100ml Suspension and 15ml Paed. drops. Acyclovir is a synthetic purine derivative. It exerts its antiviral effect on Herpes simplex virus (HSV) and Varicella-zoster virus by interfering with DNA synthesis and inhibiting viral replication. Percutaneous absorption of Acyclovir appears to be minimal following topical application of the drug to intact skin. 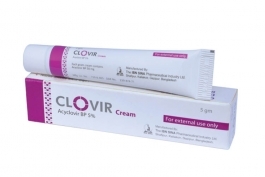 Clovir 5% Cream is indicated for the treatment of Herpes Simplex virus infections of the skin and mucous membranes including initial and recurrent genital herpes and herpes labialis. "Clovir" cream is also indicated for the prophylaxis of Herpes Simplex infections in immunocompromised patients. 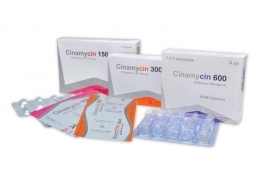 Clovir is a preparation of acyclovir. It is a synthetic antiviral agent which exerts its effect on herpes simplex virus (HSV) and varicella-zoster virus by interfering with DNA synthesis and inhibiting viral replication. It is available as 200 mg and 400 mg tablet. 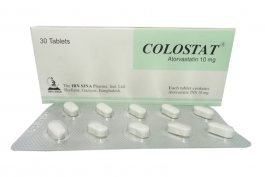 Colostat is a preparation of Atorvastatin calcium. It is a synthetic lipid lowering agent, indicated in primary hypercholesterolaemia (familial or non-familial) or combined hyperlipidaemia. It is available as 10mg tablet. 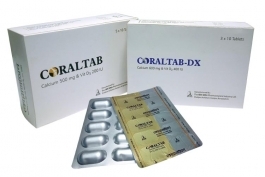 CORALTAB provides Coral Calcium and Vitamin D where Coral Calcium is composed of Calcium carbonate with small amounts of magnesium and other trace minerals. Coral Calcium has a chemical structure that is very similar to the composition of human bone Calcium carbonate. Coral Calcium is similar to other sources but ensures better absorption than calcium of other Calcium carbonate origin. Vitamin D aids in the absorption of calcium from GI tract and helps to maintain calcium balance in the body. 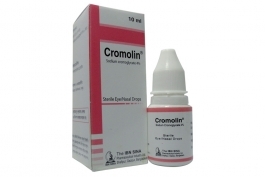 Cromolin eye & nasal drops (Sodium cromoglycate) is an anti-allergic preparation. Indicated in the treatment of allergic conjunctivitis, vernal keratoconjunctivitis, vernal conjunctivitis and vernal keratitis, Hay fever conjunctivitis, giant papillary conjunctivitis. 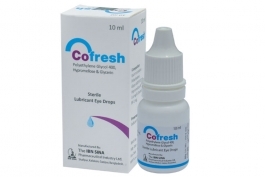 Cromolin is available as 10 ml sterile eye and nasal drops. Cyclosporine, a topical immunomodulator, with anti-inflammatory effects. Cyclosporine is an immunosuppressive agent when administered systemically. It is mainly used as aanti-gluocoma agent. 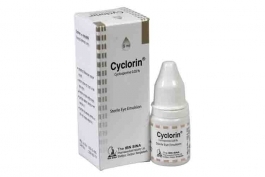 Cyclorin is available as 5 ml sterile eye emulsion.